Select a 1 Week Plan, 4 Week Plan, Subscription Plan, Individual Meals or Bulk Macros. Delivery is free for orders over $120. We deliver your meals fresh, twice a week, on Sunday and Wednesday. Store your meals in the fridge and heat one up when it’s meal time! Great for people with mental health issues. I suffer from depression and panic attacks. Hard enough to get out of bed sometimes, let alone prepare a meal or cook. I usually order fast food and have gotten real fat because of it. This is amazing. Great food, good portions, and great variety. I haven't ordered fast food since I signed up and purchased One Life Meals. I would highly recommend it. The delivery guy is sweet and always gives my doggies some attention as well, which is a plus. 😀 I ordered the Lifestyle meal option and they're always on schedule. Their food tastes yummy! Onelife is simply amazing. I never write reviews for anything but this is a game changer for me. Having healthy prepared meals at your fingertips will change your life. No more excuses for mcdonalds, pizza slices or subway. Quality of food - Excellent. Taste of food - Excellent Customer service - Fantastic!!! Duration - 4 months and counting Results - free time to go to the gym, 20 lbs fat loss, feeling like a million bucks. Excellent quality and customer service. Ideal for everyone specially those who live a busy and productive lifestyle. Great experience, highly recommended! Amazing service, amazing food, extremely accommodating with special requests! The free delievery is a bonus! 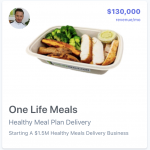 I am so happy I found out about One Life Meals and will continue to order with them. Great service, always on schedule. Food tastes great and definitely has its benefits to cut some serious calories.